Cora Egherman (‘19) attemps to throw a frisbee as Alexis Hove (‘18) defends. 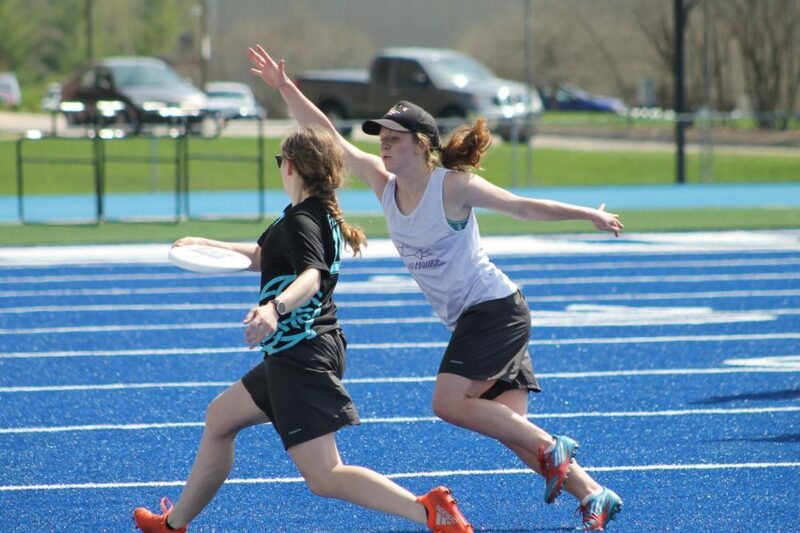 Luther College’s Freya, LUFDA, and Pound ultimate frisbee teams hosted the Ultimate Spring Showcase games on Saturday, May 5. Frisbee players from different teams came together to participate in mixed team scrimmage games on the blue turf field. With music playing in the background, frisbee players swapped sunscreen and discs in Saturday’s 80 degree sunshine. Freya captain Hanna Doerr (‘19) felt the showcase ended the season nicely. There were three parts to the afternoon’s showcase games. The games began at 1:30 p.m. with LUFDA scrimmaging. From there, Freya scrimmaged around 3:00 p.m. As an end to the afternoon, all three teams combined for a mixed scrimmage at 4:30 p.m.
“The mixed game included players from all three ultimate teams on campus, and it was a really unique experience to play with everyone on the turf,” Doerr said. Pound captain Ethan Harris (‘18) enjoyed how the event mixed players from different ultimate frisbee teams on campus. The combination of hot weather and full sun meant that the afternoon schedule was informal. Teams stopped for breaks as players came and went, often stopping to talk to people in the stands or to refill their water bottles. LUFDA player Marshall Creech (‘20) mentioned that the sun caused the turf field to heat up while they played. The showcase was originally designed for the ultimate frisbee teams to generate publicity, while coming together in community to play an afternoon’s worth of games. The event turned into an opportunity for frisbee players to spend time bonding. Although the showcase was not highly attended, a smaller group of students came to support friends and classmates later in the afternoon. Doerr also enjoyed the event.